Thanks to work by CASS Sheet Metal of Detroit, MI, the congregation of St. Paul of Tarsus Catholic Church in Clinton Township, MI can worship in a building with a magnificent non leaking new copper roof. The church’s striking roof, described as a stairway to heaven in one magazine article, is a wavy structure with the curves flowing from the top central roof ridge. The overall design looks like a bell, but the wavy roof also suggests stairs, wings or water. In fact, the church’s design was meant to inspire visions of searching and movement through the life of St. Paul and current parishioners. The new roof was the answer to a problem of water leaks that had plagued the church for years. The old roof system, installed in the 1980’s allowed rain and snow water to enter the building. The project presented challenges to CASS Sheetmetal and the church. Adding to complications of the specialty sheetmetal work, the church remained open with services every week while the project ran uninterrupted through one of Michigan’s worst winters in recent history. The leaky roof was replaced with the most watertight copper roofing system available. The replacement was double-locked with solder traverse seams! Rounding a curve of Romeo Plank Road in Clinton Township brings into view one of the most inspired and unconventional roof-lines in Michigan. The roof of St. Paul of Tarsus Catholic Church undulates like a waterslide cascading in serpentine ribbons of copper from both sides of a central ridge. This series of concave and convex curves yield an overall shape similar to a bell. The portion of roof over the former apse (the interior space housing the altar) forms an almost three-dimensional bell of copper with the same sinuous line as the rest of this remarkable roof. There was only one flaw in this heavenly canopy of copper, the roof leaked miserably since its installation in the 1980s. The parish endured the leaks with the long-suffering patience of job until sufficient funds were available for renovation ob both the roof and the church interior. For this desperately needed renovation, the parish placed its faith in Constantine George Pappas, AIA Architecture/Planning, Troy as architect and Campbell/Manix, Inc. Southfield, as general contractor. The project team brought Detroit-based Custom Architectural Sheet Metal Specialists (C.A.S.S.) 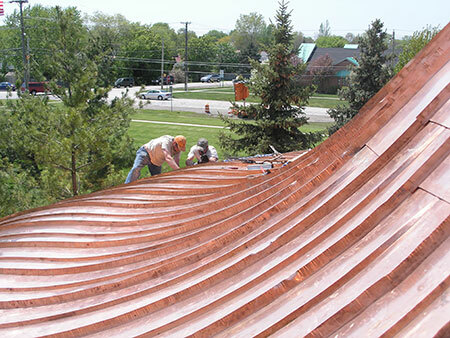 an experienced sheet metal contractor well schooled in the copper craft, into the fold as both roofing and demolition contractor. C.A.S.S.’s contract also encompassed roof protection, temporary roofing, wood decking and single-ply roofing. “We were awarded the contract after a daunting pre-award review of the completeness and qualifications that C.A.S.S. brought to the table on this difficult project,” said Glenn E. Parvin, C.A.S.S. president. Having prepared a proposal three ago, C.A.S.S. aced the final “job interview” with the help of a specially constructed mock-up of the roof’s finicky center panel. C.A./S.S. built the mock-up panel in its shop, placed it in the back of a pickup truck and delivered it to the future jobsite as part of a presentation explaining the old world craftsmanship needed to truly save the ailing roof. The mock-up clearly showed the difference between the existing copper roof and the proposed approach. The existing copper roof was a classic case of the wrong system installed in the wrong place, coupled with poor flashing details across the board and on two 70-foot-tall towers rising from the church interior and projecting through the roof. “It was a snap-on standing seam panel system that is made for decoration only,” said Parvin. “It is only supposed to be used on a mansard storefront type of application. As the most inexpensive type of panel system in the prefinished market, it’s not to be used with copper.” In this system, a seam cap – separate from the overall panel – is merely snapped over the vertical “legs” of two abutting panels. Water flowing down the serpentine roof would then migrate into the seam capos. This inappropriate system installed on the complicated curvature of the roof created the perfect storm. Rainwater and snow melt would pool in the center swale of this undulating roof, flooding both the seam caps flowing down the roof and what is called head laps or traverse seams flowing across the expanse. 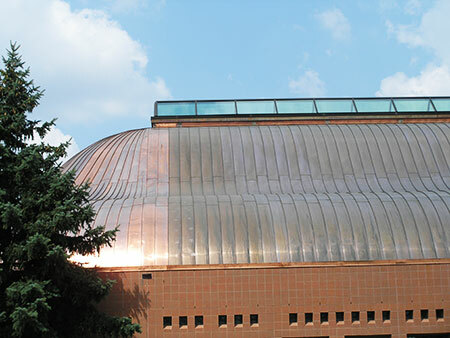 The traverse seams link the three panels needed to form each 45-foot-long ribbon of copper flowing from the roof ridge to the eave. Established roofing industry guidelines dictate the proper location of head laps or praverse seams. “in this case, the head laps needed to be placed in a 6:12 slope (6 inches of rise to 12 inches of run),” said Parvin. “the head laps in the original roof were installed in essentially a flat area where water collects.” The unfortunate end result was a roof with seams leaking both down and across the beautiful but poorly crafted expanse of copper panels. C.A.S.S. not only obtained the contract for roof renovation but the demolition contract for the entire interior, as well. The complex nature of the project compelled C.A.S.S. to request an expansion of its scope of work beyond the copper roofing trade. C.A.S.S. asked to assume responsibility for demolishing the two towers down to the roof, removal of the skylight forming the ridge of the roof, and providing temporary cover for the skylight and exposed gaps in the deck. “We believed coordination and responsibility issues could be complicated in terms of temporary weather protection in terms of infilling the gaps of the wood decking after tower removal.” said Parvin. The removal and replacement of existing electrical and fire suppression systems added another layer of complexity to the job. “Who would handle the de3ck repairs necessary at the approximately 100 electrical boxes being removed and infilled with exposed finished wood decking?” said Parvin. With the aid of Connelly Crane Rental Corp., Detroit/Redford and Holt/Lansing, C.A.S.S. began tower demolition in late October 2007. Parvin and John Martin, C.A.S.S. foreman, met with Denny Connelly of Connelly Crane to plan and execute the demolition. “Demolition of the towers took two days and the wood decking infill another two days,” said Parvin. In tearing off the old copper roof, C.A.S.S. worked with Campbell/Manix in selecting a recycling company, H&H Metals, Inkster, MI, to recycle approximately 20,000 lbs. of the old copper. “Approximately $35,000 to $50,000 in recycled copper was returned to the parish,” said Parvin. “As a theft-prevention strategy, H&H Metals used a locked dumpster with a thousand pound lid that could only be lifted with big equipment. Plus, the copper was removed on a weekly basis. All in all, H&H Metals had the best game plan to keep the copper secured. Skilled C.A.S.S. craftsmen, headed by shop foreman Rick Mark, hand tooled the panels and seams and finally shipped the carefully crafted work of their hands to the job site and up to the rooftop where on a bone-chilling morning in February sheet metal workers from Local 80 were busy anchoring the panels with stainless steel slider clips. “Its a long process,” said Parvin. “The last step is to seam the panel. We formed and hammered a double lock standing seam – a five ply seam – to create a watertight metal roof system with the same details of Old World craftsmanship as those used on traditional copper domes and large copper roofs.” Altogether, C.A.S.S. installed approximately 20,000 lbs. of copper over the 12,500-square-foot roof. Bright streams of newly minted and hand tooled copper now brighten the church roof, its fresh copper skin beaming across the expanse of a snowy field and visually warming the cold air with its metallic glow. Parvin anticipates the entire roof will be completed in spring 2008. The most difficult portion – the former apse – will soon be underway. “The three-dimensional bell is segmented all the way around and will require custom tapered panels,” said Parvin. Redeemed from an ailing roof, the St. Paul of Tarsus parish plans an expansion on its current site in the near future.